This article is about the year 1867. Wikimedia Commons has media related to 1867. 1867 (MDCCCLXVII) was a common year starting on Tuesday of the Gregorian calendar and a common year starting on Sunday of the Julian calendar, the 1867th year of the Common Era (CE) and Anno Domini (AD) designations, the 867th year of the 2nd millennium, the 67th year of the 19th century, and the 8th year of the 1860s decade. As of the start of 1867, the Gregorian calendar was 12 days ahead of the Julian calendar, which remained in localized use until 1923. January 1: Roebling's is the longest suspension bridge. February 17: Suez Canal in use. March 30: Alaska bought by check. 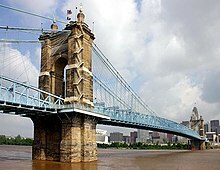 January 1 – The Covington–Cincinnati Suspension Bridge opens between Cincinnati, Ohio and Covington, Kentucky in the United States, becoming the longest single-span bridge in the world. It will be renamed after its designer, John A. Roebling, in 1983. January 8 – African-American men are granted the right to vote in the District of Columbia. January 11 – Benito Juárez becomes Mexican president again. January 30 – Emperor Kōmei of Japan dies suddenly, age 36, leaving his 14-year-old son to succeed as Emperor Meiji. January 31 – Maronite nationalist leader Youssef Bey Karam leaves Lebanon aboard a French ship, for Algeria. February 3 – Shōgun Tokugawa Yoshinobu abdicates, and the late Emperor Kōmei's son, Prince Mutsuhito becomes Emperor Meiji of Japan in a brief ceremony in Kyoto, ending the Late Tokugawa shogunate. February 7 – West Virginia University is established in Morgantown, West Virginia. February 13 – The Covering of the Senne in Brussels begins. February 14 – Augusta Institute is founded in Augusta, Georgia, later known as Morehouse College. February 15 – Johann Strauss II's waltz The Blue Danube (An der schönen blauen Donau) is first performed, at a concert of the Vienna Men's Choral Association. Later this year, Strauss will adapt it into its popular purely orchestral version for the International Exposition in Paris. 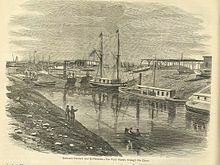 February 17 – The first ship passes through the Suez Canal. February 19 – Battle of Inlon River: The Qing Dynasty defeats the Nien rebels in Hubei, China. February 22 – The Indiana Daily Student is established at Indiana University in Bloomington. February 28 – After almost 20 years (1848), the United States Congress forbids taxpayer funding of diplomatic envoys to the Holy See (Vatican), and breaks off relations. Funding resumes, along with relations, in 1984. March – The University of Illinois at Urbana/Champaign is established (opened one year later). March 1 – Nebraska is admitted as the 37th U.S. state. March 5 – The Fenian Rising breaks out in Ireland. March 16 – An article by Joseph Lister, outlining the discovery of antiseptic surgery, is first published in The Lancet. March 23 – William III of the Netherlands accepts an offer of 5,000,000 guilders from Napoleon III for the sale of Luxembourg, leading to the Luxembourg Crisis. March 29 – The British North America Act receives royal assent, forming the Dominion of Canada, in an event known as the Confederation. This unites the Province of Canada (Quebec and Ontario), New Brunswick, and Nova Scotia on July 1. Ottawa becomes the capital, and John A. Macdonald becomes the Dominion's first prime minister. March 30 – Alaska Purchase: Alaska is purchased for $7.2 million from Alexander II of Russia, about 2 cent/acre ($4.19/km²), by United States Secretary of State William H. Seward. Newspapers call this Seward's Folly. April 1 – The Strait Settlement of Singapore, formerly ruled from Calcutta, becomes a Crown colony, under the jurisdiction of the Colonial Office in London. April 28 – I.C. Sorosis, the first women's fraternity (sorority) founded upon the men's fraternity model, with Pi Beta Phi as its motto, is founded at Monmouth College in Monmouth, Illinois. In 1888, the motto becomes the name of the organization. May 1 – The first political May Day march takes place in Chicago. May 7 – Alfred Nobel patents dynamite in the United Kingdom. Treaty of London: The great powers of Europe reaffirm the neutrality of Luxembourg, ending the Luxembourg Crisis. The Duchy of Limburg is formally re-incorporated into the Kingdom of the Netherlands. Cox and Box, by Francis Burnand and Arthur Sullivan, is first publicly performed, at the Adelphi Theatre, London. May 24 – Robert William Keate becomes Lieutenant-governor of the Colony of Natal. The Austro-Hungarian Compromise (called Ausgleich in German or kiegyezés in Hungarian (The Compromise)) is born through Act 12, which establishes the Austro-Hungarian Empire; on June 8 Emperor Francis Joseph of Austria is crowned King of Hungary. Canadian Confederation: Queen Victoria signs the British North America Act, creating the Dominion of Canada, effective July 1. June 15 – The Atlantic Cable Quartz Lode gold mine is named in Montana. June 19 – A firing squad executes Emperor Maximilian of Mexico. July – The Reverend Thomas Baker, a Wesleyan Methodist missionary (b. in Playden, East Sussex, England) is cooked and eaten by Navatusila tribespeople at Nabutautau, Fiji, together with eight of his local followers, the last missionary in that country to suffer cannibalism. Canadian Confederation: The British North America Act of 29 March comes into force, creating the Dominion of Canada, the first independent dominion in the British Empire. The Constitution of the North German Confederation comes into effect, creating a confederation of states, under the leadership of Prussia and Otto von Bismarck. July 9 – Queen's Park F.C., the oldest association football league team in Scotland, is founded. July 15 – France declares Cambodia's independence from Siam; Cambodia becomes a protectorate of France and England. July 17 – In Boston, Massachusetts, the Harvard School of Dental Medicine is established as the first dental school in the United States. July 18 – The Battle of Fandane-Thiouthioune: The Serer people defeat the Muslim Marabouts of Senegambia. August 7–September 20 – The first Canadian election sees John A. Macdonald's Conservatives elected to government. August 15 – Benjamin Disraeli's Second Reform Act enfranchises many men in cities for the first time, and adds 938,000 to an electorate of 1,057,000 in England and Wales. September 2 – Emperor Meiji of Japan marries Empress Shōken (née Masako Ichijō). The Empress consort is thereafter known as Lady Haruko. September 4 – The Sheffield Wednesday F.C. is founded, at the Adelphi Hotel in Sheffield. September 14 – The first volume of Das Kapital (later translated into English as Capital) is published by Karl Marx. September 30 – The United States takes control of Midway Island. Europe in 1867, after the forming of the North German Confederation, the Italian unification (with the exception of the Roman part of the Papal States) and the Austro-Hungarian Compromise. October 12 – End of penal transportation from Britain as the last convict ship, the Hougoumont, departs from Portsmouth on an 89-day passage to Western Australia. 62 Fenians are among the transportees. October 18 – Alaska is transferred from Russia to the USA, becoming the Department of Alaska. October 21 – 'Manifest destiny': Medicine Lodge Treaty – Near Medicine Lodge Creek, Kansas, a landmark treaty is signed by southern Great Plains Indian leaders, requiring Native American Plains tribes to relocate to a reservation in western Oklahoma. October 27 – Italian unification: Giuseppe Garibaldi's troops march into Rome. November 9 – The last shōgun of Japan, Tokugawa Yoshinobu, tenders his resignation to Emperor Meiji. November 21 – American temperance crusader Carrie Nation marries Dr. Charles Gloyd. November 23 – The three 'Manchester Martyrs' are hanged in England for the murder of a policeman whilst attempting to rescue two Irish Republican Brotherhood members from imprisonment on 18 September. December 2 – In a New York City theater, English author Charles Dickens gives his first public reading in the United States. December 18 – Angola Horror (Buffalo, New York-area train wreck): The fiery death of 49 people leads John D. Rockefeller to develop and sell his Mineral Seal 300 °F Fire-Tested Burning Oil, and George Westinghouse to invent the railway air brake, which is mandated in the United States in 1893. Pierre Michaux invents the front wheel-driven velocipede, the first mass-produced bicycle. Yellow fever kills 3,093 in New Orleans. South African diamond fields are discovered. Sylhet is constituted as a municipality. The Prohibition National Committee is formed in the United States. The Wasps Rugby Football Club is formed in Middlesex, England. At Fountain Point, Michigan, an artesian water spring begins to gush continuously. 1867–1873 – Chinese, Scandinavian and Irish immigrants lay 30,000 miles (48,000 km) of railroad tracks in the USA. Clarke School for the Deaf in Western Massachusetts opens its doors for the first time, becoming the first school for the deaf in the United States to teach its children how to communicate using the oral method. The modern rose is born, with the introduction of Rosa 'La France' by Jean-Baptiste Guillot [fr] (1803–1882). Gorse is naturalised in New Zealand, where it soon becomes the worst invasive weed. The Swedish famine of 1867-1869 begin. ^ Demey, Thierry (1990). Bruxelles, chronique d’une capitale en chantier. 1. Brussels: Paul Legrain/C.F.C.-Editions. ^ College, Morehouse. "Morehouse College - Morehouse Legacy". www.morehouse.edu. ^ Moody, T. W.; Martin, F. X., eds. (1967). The Course of Irish History. Cork: Mercier Press. p. 370. ^ Haverty-Stacke, D. T. (2009). America’s forgotten holiday: May Day and nationalism, 1867-1960. New York: New York University Press. ^ Schück, H.; Sohlman, R. (1929). The Life of Alfred Nobel. London: Heinemann. p. 101. ^ "Constitution Act, 1867". Department of Justice (Canada). July 9, 2012. Retrieved August 14, 2012. ^ a b Palmer, Alan; Veronica (1992). The Chronology of British History. London: Century Ltd. pp. 287–288. ISBN 0-7126-5616-2. ^ "US takes possession of Alaska". This Day in History. November 24, 2009. Retrieved March 31, 2019. ^ Vogel, Charity (November 30, 2007). "The Angola Train Wreck". American History. ^ Hessayon, D. G. The Rose Expert. Mohn Media Mohndrunk. p. 9. ^ "La France: Hybrid Tea Rose". Archived from the original on September 22, 2009. Retrieved September 19, 2009. ^ "A Biography of Scott Joplin". The Scott Joplin International Ragtime Foundation. Archived from the original on February 24, 2007. Retrieved February 25, 2007.